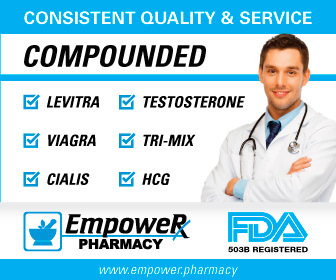 Question: How many legitimate, licensed online pharmacies (in the U.S.) are there that can prescribe and mail PDE5 inhibitors (Viagra, Levitra and Cialis) without you having to visit a doctor's office? Yes, you read that right. You can get a prescription for Viagra without ever going into a doctor's office. However, you do have to answer an online questionnaire for about 20 minutes that will step you through 20-100 diagnostic questions, depending on what you answer. Of course, this is critical to make sure that these drugs are not misprescribed such that it could endanger one's health. Viagra and Co. should not be taken, for example, with nitrates as they can cause a life-threatening drop in blood pressure. At first the Kwikmed way of doing things might seem a bit scary. However, both experience and research have shown the opposite: one large study showed the Kwikmed online process is actually more reliable than visiting a doctor when it comes to these specific medications. (Kwikmed only prescribes a total of six medications that lend themselves well to online protocols. For details, see the Kwikmed Home Page. ) In fact, Mayo Clinic did a press release explaining that "over the past nine years, KwikMed has treated more than 300,000 patients without a single adverse medical result". Not a bad record, eh? Kwikmed's track records argue that, for these six medications, their methodology is much more safe, private and efficient for customers. So what's to keep kiddies and "Viagra junkies" from abusing the system? Simple - price. Kwikmed doesn't give their Viagra and Cialis away. In fact, the price is about a third more than you would pay at a standard online retailer. For example, Cialis is about $23-24 for three 20 mg tablets at a retail pharmacy but at Kwikmed, you will pay as of this writing $33. That's just too expensive for most kids, or even college students, to abuse. To get that certification, Kwikmed had to allow access to their records for scrutiny and review by the state. Furthermore, they had to allow submission of their online questionnaires and protocols to examination by the state's medical board. So this is not a fly-by-night, pharmacy, but rather a legitimate online business of almost a decade trying to work its way up in the medical and retail community. It hasn't been an easy battle for Kwikmed: nearly all medical boards, pharmacy boards and Pfizer - the maker of Viagra - have gone on record as opposing Kwikmed's methodology. But Kwikmed has done a good job of arguing that its business model is not only legitimate, but really the correct one for a lot of guys out there. Plus, their track record speaks for itself: their customers seem to be satisifed and, most importantly, safe. Kwikmed has even received a lot of mainstream media coverage, including Fortune, Wall Street Journal and the New York Times for starters. They have come a long way since their owners were handcuffed and prosecuted in 2001. That's right - Kwikmed was gutted by federal authorities and then take over by venture capitalist Peter Ax. (Why couldn't I have a cool name like that?") Mr. Ax was a former Lehman executive who took over Kwikmed and built it from the ground up. 1) Mayo Clinic Proceedings, Aug 2008, 83(8):890-896, "Safety of Prescribing PDE-5 Inhibitors via e-Medicine vs Traditional Medicine"